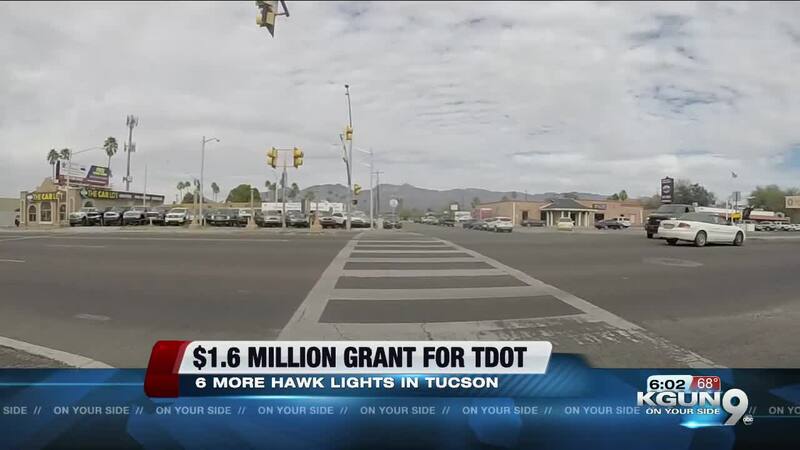 A $1.6 million federal grant will pay for six new High Intensity Activated Crosswalks, or HAWK lights at some of Tucson's most dangerous intersections. TUCSON, Ariz. — A federal grant will pay for six new crossing signals in Tucson. The High-intensity Activated Crosswalk -- or HAWK -- consists of a red-yellow-red signal format for drivers. The signals remain off until a pedestrian activates the system by pressing a button. Drivers must stop when the signal is solid red and pedestrians can cross. Since the first HAWK light was installed in 2000, studies show they are 90 percent effective in alerting cars to stop when a pedestrian is crossing, according to Michael Graham, a spokesperson for the Tucson Department of Transportation. The City recently received a $1.6 million grant from the Federal Highway Administration. There are currently more than 100 HAWK lights around Tucson. Each HAWK light costs between $268,000 and $300,000, according to Graham. TDOT will use some local funds to get environmental clearance and design work started on the new lights. TDOT said installation will begin in the spring or summer of 2021.